Benefit Bene Tint Lip & Cheek Stain in Rose Pink 4 ml / 0.13 fl oz: Travel Size. (BENEFIT Mini Benetint_. Rose Tinted Cheek & Lip Stain. Expiry is indicated by a number of months from opening). Benefit Lip & Cheek Stain Cherry Gogo Tint 4ml. Turn on the sass with this bright cherry red tinted cheek & lip stain! Cherry red cheek & lip stain. Benefit Gogo Tint Lip & Cheek Stain, Bright Cherry, 2.5ml travel size! Delivers a bright cherry-tinted pop of colour to your face. Boasting an easy-to-blend, smudge-proof formula that lasts all day. Benefit Cha Cha Tint Lip & Cheek Stain in Mango Tint 2.5 ml / 0.08 fl oz (Travel Size). Pink Orchid lip and cheek stain. I can reply efficiently. Benefit cheek tint pack 3 minis great for holidays or try before buy full size . Posie tint,sun tint,cha cha tint.3×4.0mls Condition is New. Dispatched with Royal Mail 2nd Class Large Letter. You gogo,girl! TATLER BEAUTY AWARD 2018. Benefit Gogo Tint Cherry Red Cheek And Lip Stain, 4ml, New. Condition is New. Dispatched with Royal Mail 2nd Class. Giving a gorgeous pop of cherry colour, Benefit’s GoGo Tint is a must-have in the pursuit of low-maintenance glamour. You gogo, girl! Full size Go Go Tint 10ml. Gogotint is the wildest flush you can get from a bottle! Release your inner rebel with colour that lasts!Longwearing lip & cheek stain. Bright Cherry Tinted Lip & Cheek Stain. Poppy-Pink tinted lip & cheek stain. I have never sold fakes. And never will! Kiss-proof & smudge proof, Instant pop of bright cherry colour. Pink Orchid lip and cheek stain. ‘ turn on the sass with this bright cherry red tinted cheek & lip stain! Repeat for added juiciness. Cherry red cheek & lip stain. Mini ♥ 4ml. 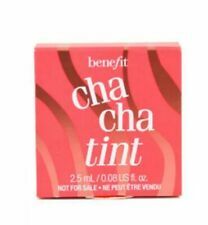 Kiss-proof and water-proof, Benefit Cha Cha Tint is an indelibly sheer tint. Mango Tinted. Lip and Cheek Stain. Smooch-proof and smudge-proof, this sheer stain will have you looking deliciously sun. This is brand new in box 100% genuine BENEFIT Benetint Rose-tinted lip & cheek stain 12.5ml FREE POSTAGE THANK YOU FOR LOOKING..AND CHECK MY OTHER ITEMS. Buy with confidence, you will not be disappointed.. I have never sold fakes... And never will!!! Kindly leave HAPPY 😄feedback once you have received your item... I will do the same!!!! Thank you!!! Benefit Gogo Tint. Lip & Cheek Stain. Having a makeup clear out.